We seem to live in a world of sound bites and memes. Every day on Facebook we see pithy sayings and joke pictures that try to sum up complex matters with a single quote (often enough attributed to someone who never said any such thing.) Sometimes the meme pretends to state a fact. Sometimes these facts are true, more often they are not. On rare occasions, if I feel that person posted the meme in good faith and would want to know if they are spreading a lie, I will doublecheck and let them know. By and large, of course, these are not posted with any purpose other than to plant a tribal flag, to let people know which side you are on. There’s no point in checking these facts or disputing these memes; they are not arrived at by any rational thought process. They’re simply posted as symbols, meant to delineate the “good” from the “bad” and mark the poster as one of the “good”. It’s almost impossible to combat this type of thought process. These posts strip away context and flatten everyone into a hero or a villain. One meme type that puzzles me the is the “everyday hero.” I can’t find it right now, but I recall a FB post which consisted of a picture of a middle-aged white man in a plaid shirt and an elderly white woman at a restaurant with a caption about how this son was visiting his elderly mother in a nursing home and wasn’t that a huge surprise in this day and age and wasn’t he a hero? It wasn’t a personal picture of the poster, but a viral picture I saw in several feeds. I am a middle-aged woman and almost everyone I know with elderly parents in nursing homes visits with them. The unspoken subtext of this meme seems to be that this bastion of middle America is doing something that “those people” don’t do. Who those people are is not clear, but the poster finds sainthood easily achievable by just acting as a normal person would in juxtaposition. I’ve been thinking about memes and sound bites a lot lately and what if anything can counteract the flattened, reductive world of social media. The only thing I can think of is stories. Often memes will trigger my memory and a story will come floating to the top, some narrative connects itself to my train of thought. Here’s an example. Before the 2018 mid-term election, I saw an awful lot of memes about how cruelty to undocumented immigrants is excusable because they are breaking the law. Doesn’t matter if this is a desperate attempt to feed their families. Doesn’t matter if the companies who benefit from this under-the-table labor also benefit from the fact that they can procure workers with no recourse when it comes to treatment or wages. None of this matters because undocumented immigrant broke the law. All this is beside the fact that asylum seekers are not breaking the law by coming to ports of entry. The point of these memes is the idea of law breaking and the fact that it allows for an almost infinite progression of punishment. A story from my childhood came to mind, one that I bet a lot of the people sharing these memes read with empathy. The story comes from the book The Long Winter, by Laura Ingalls Wilder. The Ingalls sense that the winter will be a bad one and they move to town. By the end of the winter, the settlers are starving. Pa goes to Almanzo Wilder’s store, deduces where he and his brother, Royal, are storing seed in the wall, opens it and fills his bucket. He pays for it afterwards, but the Wilder boys have put it up for seed. They need it for the spring planting. Pa takes it without asking. Pa’s family is starving, and it’s a moral calculation that he feels comfortable with. This is a context in which we see someone doing something that would be morally unacceptable in other circumstances. On any ordinary day, if Pa casually walked in and filled a bucket with grain from a hidden cache , it might get him a good punch in the nose, at least before Almanzo married Laura. Or try walking into a grocery store and casually walking in the back and getting something out of the back room where the inventory is without asking first. In this situation though, I can’t imagine one reader thinking that Mr. Ingalls was wrong. We know the context. We accept that there are circumstances that might require such moral calculations. We extend this moral courtesy to Pa for a couple of reasons. One because his story is told so well. Two, because many of us identify with him. There's another story that came to mind, a news story. A young man's wife, who had already lost a leg to cancer was manifesting symptoms of a stroke, and he was speeding with her to the hospital. Their home was close enough that it was quicker fo him to take her than to call an ambulance. A police officer followed him, cursed at him and attempted to arrest him as he was taking his wife into the hospital. There is no doubt he was breaking the law, but everyone, including the judge, agreed that his wife's life took precedence over the law. In the context of this situation, we can see that breaking the law is only a small part of the story. This begs the question: why can't we sympathize with others whose families are in crisis? Why do we strip context from people if they differ from us in skin color, religion, gender and sexuality? What context are we flattening, removing, reducing? What makes us villainize people? What is the thin line that separates their stories from ours? How often do I make the mistake of disallowing context myself? So, what am I trying to say here? I don’t know if I’m sure, other than the fact that we should extend others the courtesy of their stories, their context, their narrative. And memes and sound bites don’t allow for that. I think there’s certainly a deeper problem. Content is the poison, the meme the dart that lands it. Still, I think it can pay to think about the how of communication as well as the what. And those are my rambling, half-formed thoughts for the day. ​It's that time of year now where spring colds are rampant. Oftentimes, when you're sick you can feel too miserable to bother picking up a book. However, Jarad is sharing his thoughts on why you should bother. Happy reading! I think I get sick every single spring. My sinuses go crazy, my nose stuffs up. In short, I always feel miserable around March and April. And it's around this time that reading becomes the most challenging for me. It's very easy to wallow in my misery and just watch Netflix all day. ​In this short collection of sonnets, Drew Pisarra ruminates on the birth and death of a love affair destined to end, and all the stages in between. The poems are by turns touching, passionate, vulgar and hilarious. By following the sonnet form, Pisarra provides a method to the madness of love that inspires distillation, each poem focused. Although sonnets can seem precious or even ponderous, the poet wields the style lightly, playfully. He pushes against but still somehow channels the passions of angsty first love. The sonnet form also provides an appropriate form for the more acidic currents of aging love and the bitterness of breakup. so much that never quite passes our lips. What I never learn is what I’ll never forget. You’ve touched me without leaving fingerprints. Pisarra uses humor to good effect, not as mask, but employing it to season the real, raw feelings of love, the way the bitters bring out the flavors of a cocktail or salt the flavor of chocolate. In this poet’s hands, the sonnet is a surprisingly modern form, primal, intense and funny. ​About Drew Pisarra:The author once toured his monologues around the country and even had a ventriloquist act but has since retired from the world of dummies. His short story collection Publick Spanking was published by Future Tense some time ago. More recently as part of the installation art duo Saint Flashlight (with Molly Gross), he’s been finding inventive ways to get poetry into public spaces. ​Every reader has a ritual. Some of us listen to music, drink tea or coffee. Some of us skim paragraphs, some of us read every word. Here's some of mine! Let us know what your reading rituals are! If you’re a ravenous reader, the way I am, you’ve probably developed some sort of reading process, you’ve either consciously or unconsciously worked out a series of customs and traditions that help you get deeply into a book and leave the world outside. I’ve been thinking about this question quite a bit today, in between the chaos that the end of the semester always brings, and I realize that I’m pretty committed to reading no matter what. However, I do have certain rituals or methods to my reading process. 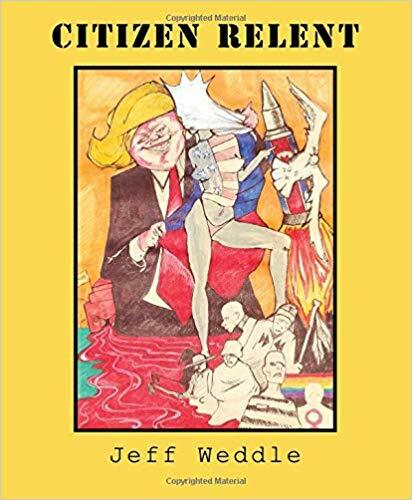 Jeff Weddle’s new book of poetry, Citizen Relent, is the poet at his most prophetic, calling out the inevitable at the cliff’s edge. As always, Jeff finds caches of hope and beauty as he feels the long sure pull of death. The poems consider the material realities of the present, the possibilities for hope and despair in the future, and the images and stories of the past from which we construct our own narratives. But the present is gone by the time the poet acknowledges it. Blessed Land, which uses a future trip to Spain as a metaphor for death, is grounded in the present, with a narrator who still feels the future at a distance, but not at a comfortable one. There are also apocalyptic glimpses into the future, with poems like Twilight and In the End, mixed with signposts from the present that give us a glimpse of our wrong turnings on the way to dystopia, like Charlottesville, and Evangelical. Only the past is disinfected enough to feel even a little safe. In poems like Buttercup and T-Bone and Eternal, the poet collects snippets of his past self as though he is finding a few precious stones in a pile of gravel. More than anything else I’ve read lately, this book feels like the passing of time, or a warning that time is indeed moving and perhaps to a bad end. He calls out the wrong turns on the path that may lead to disaster, feels that disaster can’t be avoided, then makes a certain gloomy peace with it. Oddly though, the sense of darkness distilled in these poems functions more like a vaccine to inoculate us from despair than to cause it. As always, I can’t recommend Jeff’s books highly enough. Read this one and then go and get the others! To all the messy gardens I pass, the ones where the forsythia and quince have twisted around each other like jealous lovers who can’t let go, where the grass and daffodils have tangled themselves into a standoff, barely domesticated versus natural, at the base of dogwoods and fruit trees. To the little white farm house where the Carolina Jessamine is trying to pull off the garage door and crawl inside. To the one where the wheelbarrow is melting into rust at the back of the vegetable garden, abandoned in front of the blackberries, the old shovel swallowed by fugitive dill and basil. To the garden where the sweetheart rose has covered the privet and together they form a warren of caves, a fortress for a city of rabbits. To all these gardens, you have my love. There’s something about the half-gone garden, the dreamy absentminded overgrowth, the mouldering restfulness, the way the vegetation eats away the hard lines of the sidewalks and driveways, the corners of sheds and houses that makes me want to crawl into them, into the rabbit tunnels, to lay on the soft green carpets of overgrown grass, to become small. There’s something dreamlike about the garden that’s halfway between domesticated and natural, fleabane, moss and dandelions creeping back in, waiting to see if they’re welcome, that makes me want to become a chipmunk or a rabbit in a Beatrix Potter book. Something that a fully domesticated garden can’t evoke. I’m not sure what there is about the creeping moss and decay that fills me with odd longing. Such gardens are not destinations, they’re doorways into something half-wild, half-cozy, some sort of afterlife fantasy that’s hidden away at the bottom of my brain. As much as I fight the death of my own garden, I find it oddly appealing to watch nature eat someone else’s. So, hats off to neglect and the ravages of time and encroaching nature. The beauty of it a comfort, the destination one I certainly share. Readers, I need help. I’ll get to that in the end. But I’ll start with my last reading experience. I’m not someone who reads comics. Actually, I don’t remember ever reading all the way through any before, although I’ve glanced through some at some point. However, my addiction to the Netflix show Chilling Adventures of Sabrina led me to this one. This comic is actually the basis for the show, so when I found it, I had to pick it up.